Introducing the BBE MP24M Digital Mixer, the only digital mixing system available with BBE® Sonic Maximizer® processing. The MP24M features 24 Class A microphone preamps, a virtual rack of fourteen 31-band graphic EQs, eight AUX sends and four Sub groups all with full DSP processing, and precise LED metering. The input channels feature compressor, gate, high and low pass filters, four-band parametric EQ, delay, and polarity reverse. The BBE MP24M also lets you save FX presets, Channel DSP presets and full console Scene presets via simple to use Load/Save/Copy functions. 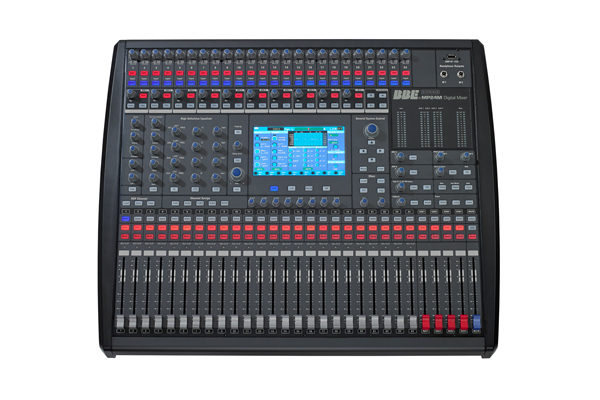 The BBE MP24M Digital Mixer was designed to create an unparalleled audio mixing experience. It is simple and intuitive to operate even though it is a powerful mixing system.